Policyd has module access control. This module can use for some aims as improving anti spam reject unlisted domain like article has been wrote before. Module access control also can use for restrict users sending to certain users/domains and this article will explain how to apply. Assume you have been install and configure policyd like the following article How To Install PolicyD on Zimbra 8.5. For information, i have user with name user1@imanudin.net. This user can sending to domain local only (imanudin.net) and deny to other domain. Open policyd webui on http://ZimbraServer:7780/webui/index.php. First, create users and domains group. Please try to sending email from user1@imanudin.net to outside and see the log information on /opt/zimbra/log/cbpolicyd.log and /var/log/zimbra.log to debug. I would like to restrict users receiving from other domains kindly suggest me on this….. I have tried the same for blocking incoming mails but in my case it’s not working. I have to allow 4 domains to send mails to my domain(Zimbra mail server) when i configure the same all the domains are getting blocked. please help me on this. How you do that? can you give me some log/another information? In Groups i have created 2 groups names owndomain (Members local domain,zimbra)and owndomain1(my company domain,@abc.com). In Main i have created a policy named owndomain only.in that source %owndomain and in destination i mentioned !%owndomain1.In configure i have linked the policy and verdict as Reject. Also i have changed all the disable policy as no. But I am receiving mails from all the domains. PLease help me on this. Yes, I have done and also did Zmcontrol restart. But its not working… Please suggest me on this. Thanks in advance.. Yes, This is enabled and outgoing mails are getting blocked.I would like to block incoming mails. Please suggest,If possible please create like outgoing block article for incoming block. Thanks in advance. This is what i am getting while running this cmd. Please let me know how to grep policyd database. Have you already test Zimbra conf in smtp level to restrict a specific user to reject messages from external domains ? I already tried this solution to prevent an account from sending messages to external domains, and it`s ok.
Now i need to prevent that same account from receive messages from external domains. I was tried to revert that configuration, but with no success (I want an account that can only send and receive messages to and from local domain). I made that restriction by amavis, and it`s work fine. I think it`s possible through smtp level too, but no success yet. I have distribution list which i want to restrict for sending emails on that from all external domains but at the same time want to allow for some external domains like, e.g. want to block *@gmail.com, *@hotmail.com, but wan to allow *@partnercompaniesdomain.com , please let me know we could get this done? saat ini user yg di restrict masih dapat mengirim email ke DL yg tidak seharusnya. Apakah harus menjalankan script tsb setiap setting restrict atau hanya sekali saja. krn sy hanya admin di sisi webUI. apakah setiap buat rule restricted baru harus jalankan script “zmcbpolicydctl restart” ini Pak ? Can you give me more information like screenshot about your problem? I want block user account to another local domain, after setting article http://linux-sys-adm.com/how-to-restrict-users-sending-to-certain-usersdomains-zimbra-8.6-on-ubuntu-server-14.04-lts-step-by-step/ . I have success block with webmail server, but I don’t have success block with mail client. Please help me. What this article can be block account send e-mail to another domain with mail client ? after configuring the policyd , emails are not receiving to the local domain. 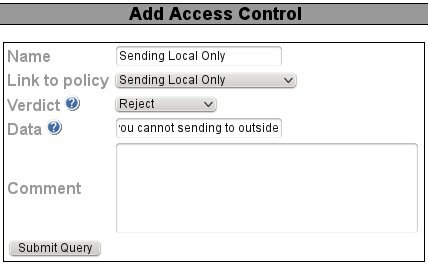 How to allow the user in zimbra webmail to send to anywhere using his external account if the user has been restricted using policyd to send to local only? do you know if there is a way to get a list of “Policy group members” users from AD windows/LDAP group? I wanted to create a mail id in zimbra called noreply@domain.com. Only outgoing should be enabled and disable incoming for this particular mail id using Policyd. You can create policy to do that. This guidelines used to work in previous versions. It stopped working on 8.8.11.